A probing, nuanced look at the culture of psychiatry, with particular emphasis on the dichotomy between the drug cure and the talking cure. Anthropologist Luhrmann (Persuasions of the Witch’s Craft, 1989) spent some time exploring an aspect of psychological anthropology that required her to examine various cultures with the psychoanalytic theories of Freud in mind. As a result, she found herself drawn to the world of psychiatrists, psychoanalysts, and their patients. What she found after years of observation and immersion (she served briefly as a psychotherapist herself) were two ways of looking at mental illness. One approaches mental disorders as disturbances of the brain, biological anomalies, treatable with psychopharmaceuticals—Prozac, lithium, and the like. The other focuses on what Luhrmann calls disturbances of the mind, distortions of the personality that respond to the many, varying forms of guided exploration of the conscious and unconscious categorized as psychodynamic therapy. Psychiatrists are usually trained in both, but they are often forced to choose one approach or the other, committing themselves as brain doctors or mind doctors. Recently the two camps began to collaborate, agreeing in essence that a combination of medication and psychodynamics is most effective, but managed care put a severe cramp in that prognosis, forcing many hospitals and doctors into the drug McCure, eliminating or curtailing the now 45-minute hour. 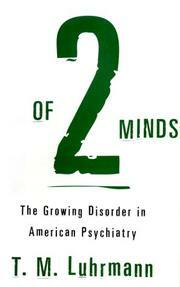 In chapters that include empathetic exploration of the stresses of medical training, careful examinations of the difficulties of diagnosis, the split between the scientist and the psychoanalyst, and the crisis of managed care, Luhrmann lays out clearly, with anecdote and case history, the ethnography that shapes a psychotherapist. Answers the question for professionals and patients alike: who is the person playing with your mind? Or is it your soul?